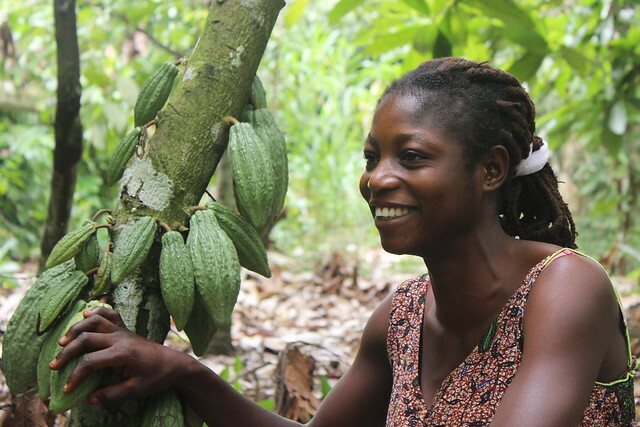 Following the liberalisation of Ghana’s cocoa market in the 1990s, Twin worked with a group of visionary farmers to help set up the Kuapa Kokoo cooperative. After just four years, its members voted to launch their own mainstream Fairtrade chocolate bar in the UK. To make this ambitious plan happen, Twin worked with the cooperative to set up The Day Chocolate Company in 1998, named in memory of Twin’s Richard Day and supported by The Body Shop, Christian Aid, Comic Relief and DFID. By the end of the first year of trading, Divine Fairtrade Milk Chocolate was launched and listed in supermarkets. In 2007, the company was renamed Divine Chocolate after their flagship product, and a subsidiary was launched in the US. Divine has developed a strong brand presence as a farmer-owned, 100% Fairtrade business, and successfully uses storytelling and photos in their marketing to communicate producer impact and connect consumers with producers. Kuapa Kokoo owns a 45% stake in Divine Chocolate, and Twin a 42.6% share. The remaining shares are held by the development finance organisation Oikocredit. As majority shareholders, Twin and Kuapa have two permanent representatives on Divine’s Board. In addition to shareholder dividends, Divine supports producers by investing 2% of its annual turnover in its Producer Support and Development (PS&D) programme. Twin manages this programme in partnership with Kuapa and Divine, developing projects aligned with the business and development priorities of both organisations.